Bloomfiled was trained by Rose Gray and Ruth Rogers of the famed River Cafe. They are famous for their "simple" fare. The irony is some of their most famous dishes are way complicated. That may be the mantra for Bloomfiled's book. In an attempt to make her "simple" food accessible to the general public the direction are beyond complicated. Her summer Tomato Soup consists of tomatoes and olive oil with some salt, garlic and basil. There are two pages of directions. You can only guess how long the recipe for her Beef and Bayley Hazen Pie is... four pages, not counting the page with the picture of the pie. The thing is, in 2010, the Australian magazine, Gourmet Traveller published Bloomfiled's recipe for Beef, Stilton and Suet Pie (basically an identical recipe) without all the pomp and circumstance. The recipes in this book are fantastic, don't let this (or the vegan marauders at Amazon derail you from getting this book), but be forewarned. When you look at the directions to any recipe, take a moment to breath. The directions feature all of Bloomfield's attention to exacting detail extrapolated. Preheat the oven to 350 degrees. Trim the root end of the fennel, removing any brown bits but keeping the end intact. Halve the fennel bulbs lengthwise. Ideally, the parsnips and carrots will be about the same size, but if the top portion is much thicker than the others, lop off this portion and halve it lengthwise. Heat half the oil in a large heavy-bottomed sauté pan set over high heat until it’s hot—rippling, crackling, and smoking a little—about 5 minutes. Carefully add half the vegetables, with the cut sides of the onion and fennel facing downward, and let them sizzle. As they slowly brown, you’ll smell the sweetness as the vegetables’ sugars emerge. Once the undersides are golden brown (about 10 minutes), transfer the vegetables, brown side up, to a large heavy-bottomed roasting pan. Repeat with the remaining oil and vegetables. Sprinkle plenty of Maldon salt over the vegetables in the roasting pan, crushing it between your fingers. Don’t stir, because you don’t want the vegetables to lose the salt. Scatter the garlic within the pan, and pop it into the oven. Cook the vegetables, gently turning them over occasionally. Continue cooking until you can easily slide a knife into and out of the vegetables (40 to 50 minutes). You’re not aiming for crispy vegetables. Arrange the vegetables and garlic on a large platter, then spoon on some of the sweet oil left in the pan. Sprinkle on a handful of chopped fennel fronds, and a little more salt, if you fancy it. 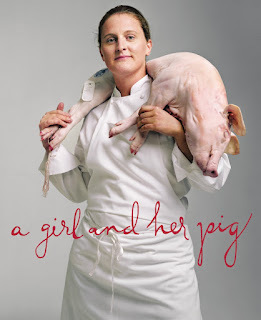 April Bloomfiled's stories about her life and food are wonderful. The photo's are great. The instructions are EXACTING and we mean exacting. Which is nice if you are reading a cookbook. To cook from this book, read the recipe, read it again and then just cook.